Ischemic heart disease is also known as coronary artery disease which happens when excessive fat gets deposited and narrows the walls of the arteries of the heart thus reducing the blood flow. This condition is known as atherosclerosis which causes heart attack. In this case mild or even intense pain in chest (angina) or sometimes no pain can occur. Thus it is advised to go for regular checkups. Abnormal heart rhythm and heart failure. Blood test: Through blood tests levels of cholesterol, sugar, fats and protein in our blood is checked which can help to diagnose the prime factor for such heart conditions. 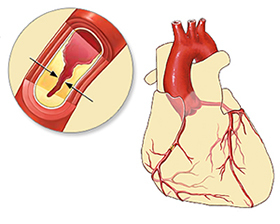 Cardiac catheterization: In this a very long, thin and flexible tube is pushed through the blood vessel in the arm or groin towards the patient’s heart. After that, a contrast material is then injected through the long tube. An X-ray video is made which shows the heart functions and its blockages. Electrocardiogram (ECG or EKG): By this method the electrical activity of the heart is viewed which helps to determine whether any part of the heart has become enlarged, has overworked or damaged. 12 to 15 electrodes helps to detect heart’s electrical currents which are attached to person’s arms, legs and chest with a sticky tape. Holter monitor: This device is used for recording the heart’s rhythms continuously. Radionuclide imaging (thallium stress test): This test is best to identify severe heart damage. In this a radioactive isotope is made to inject into the vein. A camera or scanner keeps recording and helps to diagnose the heart condition. Stress testing: it is done during exercise. This test reveals changes which happen to the heart’s rate, rhythm or electrical activity along with blood pressure. Avoid intake of sodium in your diet. Try to take healthy diets including fibre rich foods - vegetables and fruits. Exercise and practice some physical activities in your day to day tasks. Avoid smoking because nicotine narrows the blood vessels and makes the heart to work and pump more. Try to get good and enough sleep. Always keep your diabetes under control. 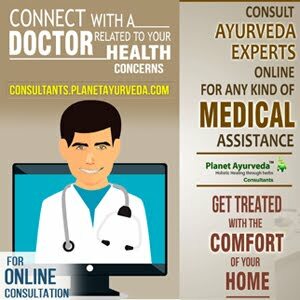 Herbal Formulation which is good supporter of Heart System. Maintains the health of Heart and Blood Vessels. Arjuna (Terminalia Arjuna) – This Herb is an important ingredient of total heart support, useful in the treatment of artery disease, heart failure. It controls high blood pressure and balances the level of cholesterol by decreasing the LDL cholesterol and maintaining HDL cholesterol in the body. The bark is very rich in Gallic acid, phytosterols and oligomeric, natural oxidants, saponins, proanthocyanidin for treating artery blockage, high cholesterol, angina, coronary artery disease and blood pressure. It enhances the pumping capacity of the heart on regular usage. Its usage is for relieving artery blockage. It strengthens the heart muscles. Ashwagandha (Withania Somnifera) - This herb has excellent properties like anti-inflammatory, antioxidant properties which helps to strengthen the heart muscles. Beneficial in stress, Anxiety and controlling blood Pressure. Brahmi (Bacopa Monnieri) - As per Ayurveda this herb is useful to control the high blood pressure in the body beneficial to maintain the better heart health. Shankhpushpi (Convolvulus pluricaulis) – The leaves and flowers of Shankhpushpi are used for treating high blood pressure. It is effective in relieving stress and anxiety. Arjuna (Terminalia Arjuna) – Very effective hypotensive, astringent, cardiac stimulant hypolipdemic and hemostatic .These amazing properties help in treating various diseases related to heart. It also strengthens weak heart muscles. It is effective in enhancing pumping activity of Heart. Punarnava (Boerhavia Diffusa) - Punarnava is has two words "PUNAR" which means ‘again’ and "NAVA" which means ‘new’. It is very good for heart. Pipal Tvak (Ficus Religiosa) - its bark, tender shoot, latex, leaves, fruits and seeds have beneficial medicinal properties. Its leaves are used for treating heart diseases and also effective in relieving palpitation of the heart and cardiac weakness. Dalchini (Cinnamon Tamala) - It acts as a cardiac stimulant. Choti Elaichi (Elettaria Cardamom) - Cardamom is an evergreen herbaceous plant. Seeds are useful in cardiac stimulation. Arjun capsules are the herbal formulation prepared by planet Ayurveda having excellent properties to manage high cholesterol levels in the body. The properties of this formulation is very beneficial to treat the heart diseases. 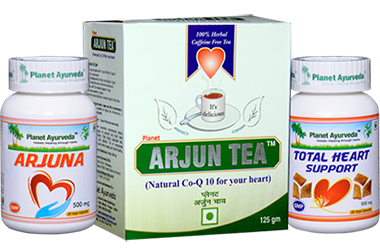 Arjuna (Terminalia Arjuna): Standard extract of Arjun capsule is used to clear the blockage of arteries and also improves blood circulation effectively. This is a natural herbal supplement for treating heart problems. Bark of this tree contains natural alkaloids and are much effective for heart problems.